With 12 carbide-tipped scarifying teeth, the DR Power Grader loosens hardpacked dirt and gravel to remove bumps and washboard and fill in potholes. The rear leveling blade then spreads the loosened material. The result is a smooth driveway that’s easier to drive on…and easier on your car or truck! Towing Vehicle: DR recommend using a heavy duty garden tractor with a minimum of 16HP, Utility Tractor or ATV to tow the Grader. Powered Actuator: The actuator allows you to fine tune the up and down motion of the PowerGrader, to adjust for the traction of the towing vehicle, and the hardness and slope of the surface. 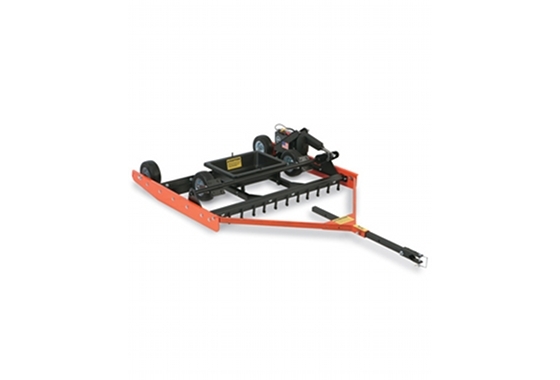 Weight Tray: Add weight to the DR PowerGrader’s weight tray to gain extra purchase on hard packed ground.